Vista Investments is pleased to announce it has completed the conversion process to convert the formerly independent Truckee-Tahoe Hotel to a Best Western Plus. This conversion becomes Vista Investments’ third Best Western Plus hotel in its portfolio, joining the Inn of Ventura and Rancho Cordova Inn. Vista Investments originally acquired the independent Truckee-Tahoe Hotel in 2013 and immediately began the approximately $3 million property improvement process which included complete renovations of all the bathrooms, room FFE upgrades, interior décor, and added a mini mart. Vista Architecture & Design, a key department within Vista Investments, worked closely with Best Western to meet their Plus requirements while integrating Truckee wilderness inspired art, fabrics, and furnishings. 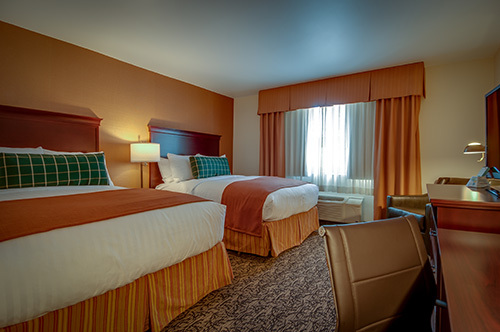 Each of the 100 guest rooms feature at least a 42” HDTV and complimentary Wi-Fi internet access, while guests receive complimentary access to the fitness center, a full hot breakfast buffet in the mornings, and a 24-hour business center for print and copy needs. Vista Investments is a full service hotel development company, headquartered in El Segundo, CA that owns and operates hotels throughout California. Vista Investments offers a unique composition of expertise as a full-service hotel management, investment, development, and architecture and design company, while also operating the Vagabond Inn franchise company. Its concentration is on strategic hotel development and acquisition of premier select-service hotels, located in areas with high barriers to entry where value can be added through management, design, branding and property improvements. For more information, please go to: http://www.vistainvestments.com.